This overnight antibacterial lotion helps to clear blemishes, reduce inflammation and diminish the formation of comedones, while you sleep. A clinically proven blend of stabilized Retinol (Cavamax), Salicylic and Lactic Acids effectively combats breakouts, neutralizes bacteria and decongests clogged pores. Phytosphingosine and Totara Extract inhibit bacteria helping to clear the skin. Tea Tree and Broccoli Extracts provide antioxidant protection and assist to reduce inflammation. Helps to reduce inflammation and breakouts. Agua (Distilled Water), Hamamelis Virginiana (Witch Hazel) Extract, Alcohol Denat., Glycerin*, Hydroxypropyl Starch Phosphate, Salicylic Acid, Alcohol, L-lactic Acid, Retinol, Totarol, Cyclodextrin, Phytosphingosine, Epilobium Angustifolium Flower/Leaf/Stem Extract, Squalane, Eucalyptus (Globulus) Leaf Oil, Sulforaphane Glucosinolate (Broccoli), Mentha Piperita (Peppermint) Oil, Melaleuca Altenafolin (Tea Tree) Leaf Oil, Simmondsia Chinensis (Jojoba) Seed Oil. For whatever reason I have recently developed some acne on my chin as I approach my late 30s, and purchased this product to treat this area at night. It is very effective and quite powerful. There is some stinging if my skin is broken, but otherwise it applies smoothly and has done a good job at treating the comedynes on my chin. I will add that you should simply smooth it over the skin and not rub, rub rub it in as the gel/cream texture will ball up and flake if over-applied. A little goes a long way and this product will last a long time. 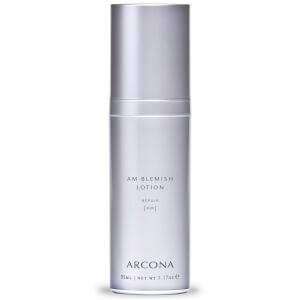 Another ARCONA winner!